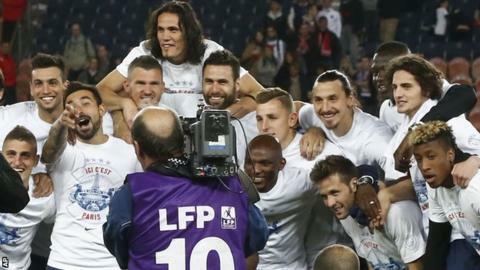 Paris St-Germain celebrated retaining the French title but saw their party dampened as Rennes inflicted a first home Ligue 1 loss of the season. Laurent Blanc's team were crowned champions shortly before kick-off after second-placed Monaco were held to a 1-1 draw by Guingamp. Monaco's draw left PSG with an unassailable seven-point lead ahead of the final two rounds of matches. Ezequiel Lavezzi gave PSG an early lead before mid-table Rennes fought back. PSG are the first team to retain the French title since Lyon in 2007-08. Goals from Foued Kadir and Paul-Georges Ntep gave the visitors a 2-1 lead before the half-hour mark. Even the return of Sweden striker Zlatan Ibrahimovic, who scored 40 goals in 44 games before injuring his thigh against Chelsea in April, could not inspire a fightback at the Parc des Princes. Nevertheless, the Parisian club's players and staff were given a rapturous reception as they performed a lap of honour after the full-time whistle. Match ends, Paris Saint Germain 1, Rennes 2. Second Half ends, Paris Saint Germain 1, Rennes 2. Corner, Paris Saint Germain. Conceded by Steven Moreira. Attempt saved. Zlatan Ibrahimovic (Paris Saint Germain) header from the centre of the box is saved in the top left corner. Assisted by Javier Pastore. Alex (Paris Saint Germain) hits the bar with a header from the centre of the box. Assisted by Maxwell with a cross. Lucas Moura (Paris Saint Germain) wins a free kick on the left wing. Foul by Romain Danze (Rennes). Foul by Ola Toivonen (Rennes). Offside, Paris Saint Germain. Maxwell tries a through ball, but Edinson Cavani is caught offside. Attempt saved. Zlatan Ibrahimovic (Paris Saint Germain) right footed shot from outside the box is saved in the centre of the goal. Assisted by Maxwell. Offside, Paris Saint Germain. Maxwell tries a through ball, but Zlatan Ibrahimovic is caught offside. Foul by Yohan Cabaye (Paris Saint Germain). Tiemoué Bakayoko (Rennes) wins a free kick in the attacking half. Substitution, Rennes. Romain Alessandrini replaces Paul-Georges Ntep. Attempt missed. Ola Toivonen (Rennes) right footed shot from the right side of the box is high and wide to the right. Assisted by Vincent Pajot. Attempt blocked. Javier Pastore (Paris Saint Germain) right footed shot from the left side of the box is blocked. Assisted by Blaise Matuidi. Attempt missed. Blaise Matuidi (Paris Saint Germain) left footed shot from outside the box misses to the left. Assisted by Zlatan Ibrahimovic following a corner. Attempt blocked. Javier Pastore (Paris Saint Germain) left footed shot from the right side of the box is blocked. Substitution, Rennes. Ola Toivonen replaces Nélson Oliveira. Substitution, Rennes. Romain Danze replaces Foued Kadir. Blaise Matuidi (Paris Saint Germain) is shown the yellow card. Attempt blocked. Javier Pastore (Paris Saint Germain) right footed shot from the centre of the box is blocked. Attempt saved. Edinson Cavani (Paris Saint Germain) right footed shot from the left side of the box is saved in the centre of the goal. Attempt missed. Javier Pastore (Paris Saint Germain) right footed shot from the centre of the box is too high. Assisted by Edinson Cavani with a cross following a set piece situation. Attempt blocked. Zlatan Ibrahimovic (Paris Saint Germain) right footed shot from outside the box is blocked. Yohan Cabaye (Paris Saint Germain) wins a free kick in the attacking half. Foul by Vincent Pajot (Rennes). Attempt missed. Edinson Cavani (Paris Saint Germain) header from the centre of the box misses to the right. Assisted by Marquinhos with a cross. Javier Pastore (Paris Saint Germain) has gone down, but that's a dive. Attempt blocked. Lucas Moura (Paris Saint Germain) right footed shot from the left side of the box is blocked. Assisted by Maxwell. Corner, Paris Saint Germain. Conceded by Vincent Pajot. Corner, Paris Saint Germain. Conceded by John Boye. Corner, Paris Saint Germain. Conceded by Foued Kadir. Attempt blocked. Edinson Cavani (Paris Saint Germain) right footed shot from outside the box is blocked. Substitution, Paris Saint Germain. Lucas Moura replaces Thiago Motta. Substitution, Paris Saint Germain. Zlatan Ibrahimovic replaces Ezequiel Lavezzi. Foul by Abdoulaye Doucouré (Rennes).